In this video I got one of my students to do some blind folded Chi Sao. For those of you that don’t know what Chi Sao is, it is an exercise to training sensitivity in your hands, wrist & forearms. 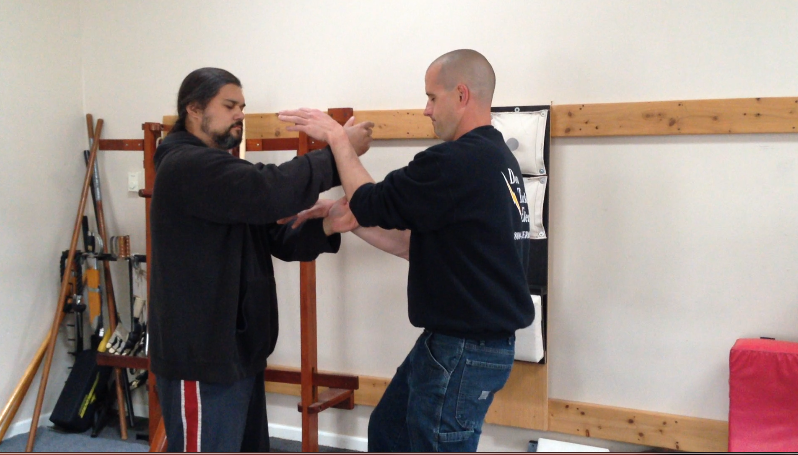 It also helps develop your structural integrity and footwork in the Wing Chun system of fighting. A lot of folks who follow martial arts looks at Chi Sao and think that it’s the way that a Wing Chun man fights. Nothing could be further from the truth. Anyone who has seriously trained in Wing Chun understands that Chi Sao is just a training drill. Granted if you practice Chi Sao it helps bridge the gap between sparring and fighting. You can train as docile or aggressive as you and your partner agree on. Practicing this exercise is a good way to stress test your skills in a safe environment. The purpose of practicing Chi Sao with your eyes closed is to teach you to rely on your feeling sensitivity rather than your eyes. If you have sparred before you know how easy it can be to be fooled by a feint. This exercise can help you overcome flinching…..